Having a stylish jacket in your wardrobe is a perfect way to transform any outfit. There are many types out there and it’s up to you which one you wear to complete your own look. A blazer is extremely versatile. Slip it over a smart top for an interview, pair with skinny jeans for after-work drinks or put on your favourite heels for a night out with friends. Blazers often fall under the work attire category in many peoples’ wardrobes. But they don’t have to be plain or dull. Think about the types of neckline that are out there. A rounded neckline on a blazer can be paired perfectly with a ‘peter-pan collar’ (flat collar with curved edges) or a scoop neck cotton top. There are also plunging blazers out there that nip in at the waist and accentuate your curves. The options are endless, but whichever style you choose, make sure it complements the rest of your wardrobe. One style that we’ve seen a lot of on the catwalk this season is soft-tailoring. This type of tailoring is less about straight cut and structured style and more about drapes and fashionable ease. It also makes blazers more wearable — for example, you wouldn’t feel out of place wearing a waterfall jacket to the office or a restaurant. When it comes to buying a blazer, some people are put off by the sleeve length. It’s hard to get a length that’s suited to you without it hanging over onto your hand or sitting short on your arm. Consider three-quarter sleeves — a stylish alternative to the traditional cuff-linked jacket. For some extra detail, why not look for frilled or frayed sleeves. With dark denim and a tailored shirt, your blazer can be a perfect alternative to a cardigan for work. Add some heels into the mix for a dressier look that is appropriate for all fancy occasions! A denim jacket is a must-have for everyone’s wardrobe — including the men! It’s not as dressy as the classic blazer but a dark denim jacket can be matched with a jumpsuit or going-out outfit to complete the look (and add warmth!). If you’re looking to dress down an outfit, denim can a perfect choice. You may feel too formal in tailored trousers and a crew neck top for a garden party but add your denim jacket and you’ll fit right in. Even though they usually sit above the waist, this style of jacket pairs nicely with a maxi dress or floaty summer dress. It becomes less appealing through the winter months as it isn’t super durable during harsher conditions. But, even if it sits in the back of your wardrobe for half the year, you’re guaranteed to get your wear out of it when the sun comes out — the denim trend is never ending. One trend that seems to pop up every season is the leather jacket. It’s a classic that can be worn with distressed jeans and a graphic t-shirt or with a patterned dress in the autumn months. The leather jacket offers an edgy twist to whatever your wearing — giving off that biker chick vibe. Team it with distressed black jeans, an over-sized shirt and heeled ankle boots to complete the look. 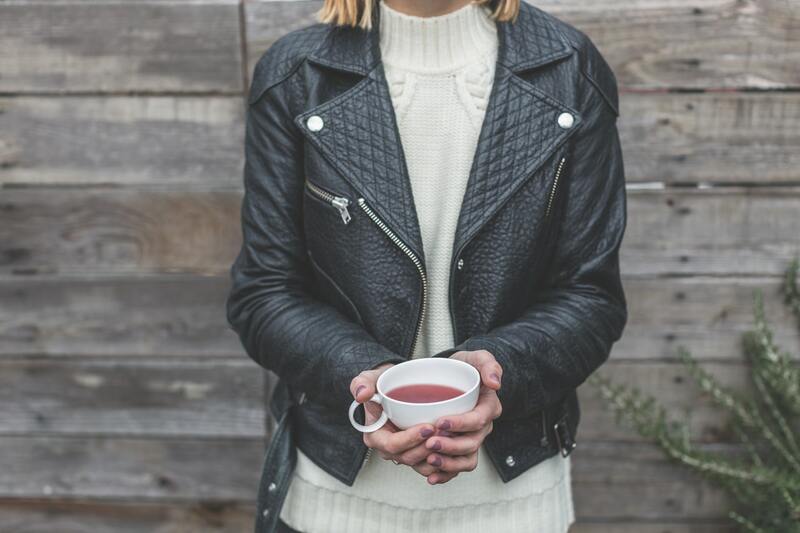 Use a leather jacket to make your outfit pop with colour too. Invest in a red or blue jacket to add a pop of colour to a plainer outfit. Because of its thicker material, a leather jacket is most suitable in the colder months — team with a chunky knit scarf and knee-high boots to keep you super cosy. What’s hot now? As we mentioned, soft tailoring is definitely in! Adding a lightweight, comfortable jacket to your wardrobe this season will keep you stylish and up to date with the latest trends. Consider a Helene Berman jacket; the pastel colours are perfect for this season and the style can be matched with a range of outfits.